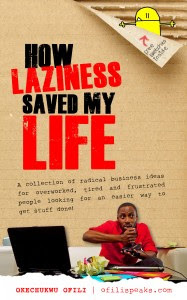 As promised, today I am giving away Okechukwu Ofili's second (and latest) book, "How Laziness Saved My Life." Just in case you do not know who Ofili is, here is some brief information on him in his own words: "Ofili is an award winning coffee drinker motivational speaker, author, success coach and spy entrepreneur who blogs about life, success and entrepreneurial excellence." [Source] His words, not mine. Yes, even the words with the strike through across them are his words. The word "Source" is not. I ordered it on Amazon about a week ago, but it is a "pre-order" meaning the book will not be released or shipped to me until May 28, 2012. The delayed release date is because of a print error, and Ofili's convictions about quality and practicing what he preaches. Another reason to read the book, ba? Live in North America, i.e. US, Canada, Mexico (I apologize in advance for all those who will vex for me on this note, but I intend to extend future giveaways to just about everyone, anywhere. Yes, even in the North Pole). Answer this Question: Name ONE song (and the artiste if you know his or her name) you listened to in the last 24 hours. That, my friends, is all. Oh, wait, I have not told you the deadline yet. Since the book will not be released until May 28, 2012, that is the deadline to submit your entry. To enter this giveaway, just follow the rules above and answer the question in the comment section below. I will randomly pick a number and announce the winner the day after the deadline. The winner will be contacted using the e-mail address used to enter his or her comment, so please use a working e-mail address. That is all for now o. All the best, guys! ermm, Mr Ofili, win ke? Of course, I will vex. Why didn't you just order from amazon and ask them to ship to Nigerian addresses, if the winner resides in Nigeria. After all, amazon ships to Nigeria. Ahn ahn, it shouldnt be that hard naa. Congrats to Ofili, and I hope I win. I listened to Brymo Ara's Remix by one guy like that. 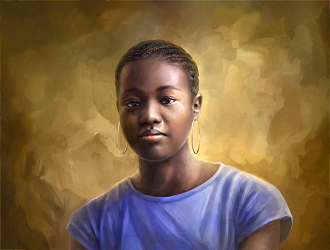 And yes o, congrats on your new domain, may it be the continuation of more great stuff! I want to win, but i feel like it will be selfish of me to enter... the dilemma. How is my Ibeji doing? Thanks Myne! Appreciate the support! I don't think amazon ship to Nigeria. But I can get the book for you to anywhere in Migeria...except where bokoharam lives (just jokin). Do let me know if you need any help. We want to keep ur identity secret cough cough. *pouty mouth* Relentless we want our own too o. :-) Wish the potential winners all the best! I want Ofili's book and if you dare give it to Ofili...you will hear from me. My facebook name is JostWrite and I live in the North America and in addition, I danced to "Chop my Money" by PSquare, Akon and MayD. Toin: LOL, ba? I suspect the award winning coffee drinker (and spy) part is not really a typo, but is true. But I don't have proof ... YET! Lue: Yeah, there will be more giveaways everyone can participate in beginning in June. Don't worry, Ofili cannot win his own book. He knows that! Ofili: Why are you coughing? There must be something in the air ... LOL at keeping my identity secret. Last time I checked you offered a CASH reward for information on my identity. I smell a conspiracy! Meanwhile, thanks for offering to help. I will let you know if I do need help with this. Plus, I was not even banking on Amazon shipping to Nigeria. Shipping to Nigeria should not be a problem though. Myne: Yes o, I hope and pray so too! Thanks for the good wishes and your support. Michael: You too?! Okay, beginning in June, everyone can participate in the giveaways. I guess you can "un-pout" now. Yes, all the best to the potential winners! AdeOla: LOL! So you were coming here to scold me ... God is on my side! Please update accordingly. Though I am surprised you couldn't find me sha. This thing was supposed to update automatically. We shall see. I have taken note of your entry and shall notify you if you win. Thanks for participating o! I appreciate your support. LDP: You too? Don't worry. From June you will be able to participate. Yellow Sisi: Awww! But, I understand, seeing that I myself am not exactly putting my real name here. Please order the book if you can. I am sure Ofili will appreciate the support. This geographical disqualification thing is ojoro ooo,anyway i can kuku get the book in lagos traffic,Lol iJoke, at Ofili where can we get the book in Lagos? Atilola: This is true. The boxing match part, that is. LOL! I did not know Amazon shipped to Nigeria sha. Praizhouse: Ojoro ke? This is the first one and there will be others. LOL at getting the book in Lagos traffic. I will find out where you can get the book in Lagos. I was listening to some Green Day on Pandora Radio -- I think the last song was Basket Case. Dayo: LOL! Thank God it didn't sha. No, you did not miss the deadline. I have your entry and shall take note of it. Na book we dey give away not CD now ... LOL! Thanks for supporting.